Good news yesterday with Auckland Transport signing a $100 million contract to build the Eastern busway between Panmure and Pakuranga. The busway is long overdue and will be a critical part of finally helping to serve the urban area of Auckland with the lowest levels of public transport use. Transport Minister Phil Twyford and Mayor Phil Goff today joined Auckland Transport officials to sign the contract with New Zealand-owned construction company Fulton Hogan. Using the busway and the new Panmure rail station, commuters will be able to travel from Botany to Britomart in less than 40 minutes cutting travel time by more than a third. More people on public transport means fewer people in cars and less congestion. The Eastern Busway consists of several major pieces of infrastructure, including completing the busway between Panmure and Botany, stations at Pakuranga and Botany, the Reeves Road flyover at Pakuranga Town Centre and better space for people walking or cycling. A reduction in journey times and better accessibility to other parts of Auckland will improve the range of employment and leisure options for people in Auckland’s south-east. These factors were included as part of a report showing that AMETI Eastern Busway will generate around $680M of additional GDP over a 40-year period. Construction begins in April and will take approximately two years. Parts of Lagoon Drive and Pakuranga Road will be widened to create a dedicated, congestion-free busway, similar to the successful Northern Busway. Panmure Roundabout will be turned into a safer signalised intersection, there will be new paths for walking and cycling, improved public spaces and reserves, a second bridge across Tamaki River and several intersection will be improved. The contract with Fulton Hogan also signals a strong commitment to “social procurement” with specific clauses around environmental standard, minimum wage payments and recruitment practices targeting youth, Maori and Pacific people. AT has also been working closely with Mana Whenua to recognise the cultural significance of the area through design new public spaces, reserves, enhanced streetscapes, landscaping and Mahi Toi (art works) along the project route. One of my major concerns with the busway is just how long it’s taken to get to this point. The first stage, the new Panmure bus/train station was opened five years ago. If we’re going to be successful in delivering not just the rest of this busway but also all of the other major PT projects we need to build, we’re going to have to get better at this. AT say once complete the busway could move about 7,500 people an hour, that’s not much fewer than arrive at Britomart on trains every morning but it also highlights why it’s so important the council and government agreed to future proof the City Rail Link for 9-car trains. Once construction starts it means we’ll have three major PT infrastructure projects underway at the same time (CRL and Northern Busway extension) and the possibility of more soon with the Puhinui interchange, the third main/electrification to Pukekohe and light rail. I’m looking forward to being able to ride the busway in 2021. As a Panmure resident I won’t be riding the busway myself but I sure am looking forward to being rid of the stupid giant six-legged roundabout. Walking to Panmure station is going to be so much easier and safer. National mp for pakuranga Simeon Brown claims that AT figures show the buslanes will only take 150 cars off the road out of a daily flow of 50,000. He also claims national has delivered the project without any fuel tax. So, the project is useless but National would have done it better. Just like there was no housing crisis but National was solving the housing crisis better. That sort of expedient talking out of both sides of your mouth rubbish is fairly typically for National. 150 cars off the road per day???. Is it so easy to lie so barefaced? Him and Mark Mitchell seem to have the same script writers . And how has National delivered this? That boy is struggling for relevance, what with projects contrary to Nationals philosophy going ahead in his electorate and Jamie Lee Ross next door! Why isn’t this being built as a tram line? Building it as a busway is a backwards step isn’t it? I noticed last week houes being demolished along the Pakuranga Highway, in the section between the old Panmure bridge and the town centre . Given this thing has just been signed yesterday, are they making way for something else? And why not just run a rail line down it instead, you know crazy modern 1st world city stuff like mass rapid transport with zero emmisions, not 50 x 8-10 litre diesel engines in various states if disrepair with an equivalent amount of drivers from a plethora of private bus companies ensuring their shareholders returns are maximised. Never cheaper than now AT! The contract for demolishing the buildings in the way of the busway was awarded last year to Yakka TDC. The contract for constructing the busway itself has just been awarded to Fulton Hogan. The advantage with the busway is that buses from other parts of East Auckland can drive straight onto it and take advantage of the right of way all the way to Panmure. So it can speed up a number of different services. Light rail would require a transfer from bus to light rail then a transfer from light rail to heavy rail. Heavy rail wouldn’t require any additional transfers but it would be tremendously expensive (more land acquisition, larger and more complicated structures etc). I see your point with buses connecting from the suburbs far east, but if trains were used, they could proceed straight to wherever on the rail network. And arguably rail requires less land. It’s a straight line from the Panmure junction, more or less with pretty tame grades and far less maintenance intensive long term. And ZERO emmisions, if we as a country are ever going to take this subject seriously as Jacinda has only just emphasised! Long term, not Auckland’s typical myopic vision. It’s pretty hard to see how a 4-way connection (north and south, bothway) for heavy rail could be implemented at Panmure. There’s not the space for it. Meanwhile, the entire train network is shut down ahead of a three day shutdown and all I have seen from AT is a tweet blame shifting it all to Kiwirail. All the buses are full and i count 40 pissed off people at the bustop outside my office. i can’t get to an important meeting in the city because, you know, i trusted AT to have a functioning PT network. No comms. WTF do AT do all day? Do they not practice having a disaster comms plan ever? no matter how many times this happens there is never any communication from them. Hence why i stopped using PT and drive/bike. Haha, you think AT comms is bad? Try New York. So… How you feeling now that it’s been revealed that it really _was_ KiwiRail’s failing this morning. Agreed that AT is crap at communication. Get the feeling that no matter how their culture may evolve, it’ll never include a mature, customer focused comms strategy. It’s late, but better late than never. Simeon should push to change the Nationals name to the Carbon Party, wear Texan hat’s and drive pickup trucks with electric chairs bolted to the bed!. You mean they really wanted a T3? Wait till they have to pay a carbon tax. Is that how they want to contribute their share to achieving Carbon Zero? A two year project opening in 2021? This would usher in a new era of actually getting large infrastructure projects done in a reasonable period of time. I welcome the news but colour me slightly sceptical, Matt, that you’ll actually get your ride on the busway in 2021. Only the Panmure-Pakuranga section is due for completion in 2021. The entire busway to Botany is not due for completion until 2026. It’s not even clear whether the Reeves Road flyover, which is a huge project in itself, is part of the first stage. It will be a motorway section over the top of the Pakuranga Plaza shopping centre, just like Sylvia Park. Thanks Neil, I had missed the fact that it was being built in stages – despite the fact that the article Matt quotes clearly states that. 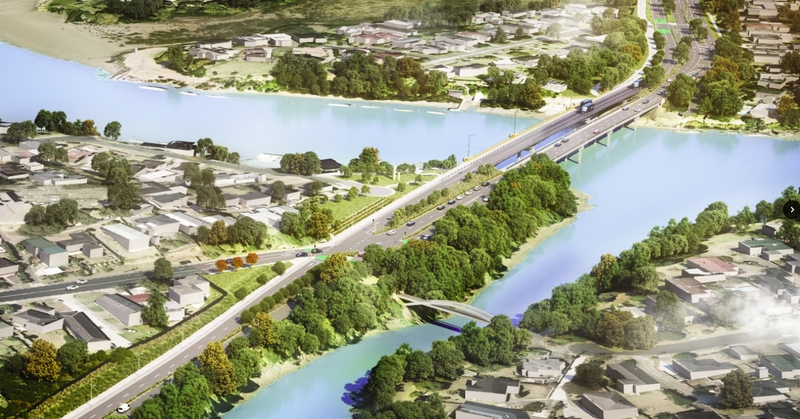 There is still a new bridge over the Tamaki River to be built as part of the first stage so two years will still be a stretch if past history is anything to go by – but doable. Maybe you will get your ride in 2021, Matt. flyover is in second stage. Yes. And the traffic that induced would make for an interesting post implementation review. Extra road capacity… extra traffic. They should have closed roads to make the town centre more walkable at the same time. 40 minutes sounds very optimistic. Is it based on perfect conditions where the bus just arrive at the same time the train arriving? What if the bus is out of sync with the bus? Like the bus arrives after the train leaves? It would means the 40 minutes journey suddenly becomes 60 minutes during off peak. That shows we have to improve the train frequencies to make this bus way effective, especially off peak. Yes need those train frequencies up. I think with just the limited bus stops & frequency improvement on the buses too this is quite doable as it currently shows this as a theoretical trip time now in Google. I like Twyford quoting the congestion free network. I’ve always thought that getting the right language to be talked was the star of the positive changes that are starting to be delivered. I also think that we should talk more about the fourth main, as it’ll probably be needed sooner than anyone realises. So in the interest in not starting another mega project how about we leave Middlemore station as it is for the time being. So starting at Puhinui heading North we run another line down the western side to just before Middlemore station. So a set of points takes it back on the mainline where it has the option of either continuing onto Otahuhu station or diverting down the existing third line into the freight yard. I think this is what Kiwirail intended to do at the time of electrification. So heading south on the eastern side there would be a set of points immediately south of Middlemore station which would lead onto a passing loop which would stretch almost to Papatoetoe station where it would rejoin the main line. So there would be three platforms at Puhinui with the new one being on the western side and only the two existing ones at Papatoetoe and Middlemore but there would be room for overtaking trains heading both south and north. There are three platforms at Otahuhu however the third platform has no tracks but it has being planned. I am not to sure what level of service improvements this could bring but I would hope it would allow for regional trains to run to Puhinui and maybe some express services and of course more freight trains. See how that works out before committing to major works which would be very disruptive..
Would help, or take the onetime disruption hit and build it properly, and at least prepare for the 4th if nit build that too. What version of the future is there when we run fewer trains here? No risk to building future capacity here asap. Well I could imagine it taking 1 to 2 years but to do the station rebuilds would be more like 5 to 10 when you think what else is going on. Plus I am thinking most of it could be done without having to stop the trains. Since this is a new busway it would be nice to see some future proofing with installation of ground level power supply rail in readiness for the eventual conversion to a light rail tramway road. I believe that the gradients on Lagoon Drive rule out light rail on the busway alignment. Furthermore, multiple frequent bus routes will be fed into this busway, by converting it to light rail, you would adding an additional transfer for a large portion of the users. The biggest advantage of light rail is that less space is required for stations, this is hugely beneficial in places like Queen St or even Dominion Rd, but is not necessary in the less dense South Eastern suburbs.